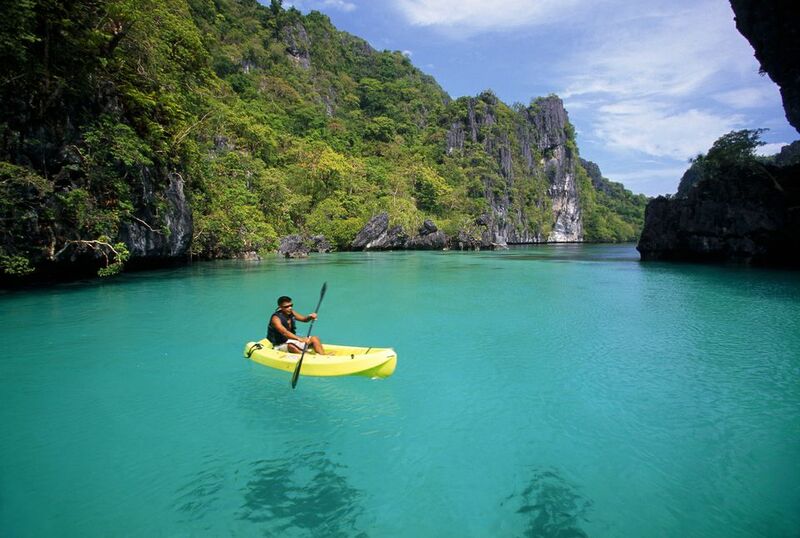 The Philippines archipelago of El Nido is Paradise—with a few caveats. Take note of the tips below to ensure a smooth vacation in El Nido and Bacuit Bay. El Nido is best seen during the months of November to May. In the first half of this period, cool northeast winds complement the sunny skies, allowing you to explore the islands in comfort. As the summer months of March and May set in, the heat turns up as well; bring enough sunscreen to protect yourself. All throughout these months (El Nido's high tourist season), the sea is relatively calm, and underwater visibility is good, about ten to thirty feet. The southwest monsoon from June to November brings the rainy season and reduced travel traffic. While prices for all resorts and facilities are lower during the rainy season, the weather is less cooperative: seas are choppy and the unpaved roads become muddier and more difficult to travel on. Bring light cotton clothing, and pack as light as you can if you're flying there, as Air Swift (which flies into the local airport) has a 12kg limit on baggage. Dress modestly while you're in town—Filipinos are still rather conservative in rural towns like El Nido, despite their constant contact with Westerners. While you're in town, favor rubber flip-flops over shoes—the latter will just get in the way, as you'll mostly be on the beach or jumping on and off pump boats between islands. Snorkeling gear, diving gear, windsurfing gear, and kayaks can be rented in town. Getting to El Nido depends on your budget and on your appetite for punishment. Flying in is relatively effortless, but can be expensive. Going overland from the capital of Puerto Princesa is the cheapest way, but requires a tolerance for hours of travel over rough roads. Riding a boat depends entirely on the whims of the weather. El Nido local transportation is limited to the jeepney, but more commonly the tricycle (a motorcycle with a covered sidecar attached). The fixed rate for tricycle travel within El Nido town is $0.20 (PHP 10). If you want to travel further out, jeepneys provide town-to-town transport. Motorized vehicles can be hired from local providers; motorbikes are a preferred mode of transport, as they can easily handle the area's steeply-inclined dirt trails. Conservation Fee: A small conservation fee of $4 (PHP 200) per person will be collected by your tourist establishment for every night you stay. The fee goes to the El Nido Protected Area Management Board. For stays of ten days or more, a maximum fee will be collected. This money is used to safeguard El Nido's environment, offsetting any impact you make on the bay's ecosystem. Have your money and travelers' checks converted to the local currency at Puerto Princesa or in Manila, before going to El Nido. The El Nido Boutique and ArtCafe has a travel center that offers money changing services and credit card facilities, among other things. Cost of meals and personal items are relatively low; expect to pay about $0.50 for a can of Coca-Cola™, and a decent meal will cost about $2-$4. El Nido is not yet fully electrified—the current runs from 3 pm to 3 am every day only, and resorts usually have their own electric generators. Cell sites for Philippines cellphone providers Smart and Globe are active in El Nido, although Smart may have a certain edge over Globe in terms of access. If you have a GSM phone, check with your provider if they have a roaming agreement with Smart or Globe. Internet services can be found all over El Nido Town. Numerous internet cafes advertise their wares all down the main streets of Calle Real and Calle Hama. There are no hospitals in El Nido; a government-run Rural Health Unit provides healthcare for the town and its visitors. The clinic's doctor and his staff can manage minor health emergencies, but major situations need to be taken all the way to the provincial capital of Puerto Princesa. A few local pharmacies can dispense common over-the-counter medicines like cough syrup and paracetamol. Bring your own personal prescription drugs, as you aren't likely to get your prescription filled in El Nido. Malaria is endemic to Palawan, so bring your choice of insect repellant and slather it on periodically. El Nido rooms usually come with mosquito nets; ask for one if your room doesn't come with one.